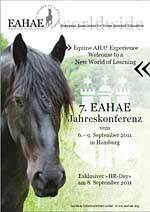 EAHAE International Association for Horse Assisted Education - 2011 Annual Conference Feedback. Hola from Mexico! Catherine and I just got back from our Europe trip. We learned a lot from all of you, and want to thank the organizers and everyone involved for making the conference a success. We´d also like to send a special thanks to all those who sacrificed their coffee break for our video interviews. It will take us a while to edit the video, but we will be sending it to the EAHAE office when it is ready. It was great to have met all of you, and whenever anyone makes it over here Tequila will be on us. A big thank you to all the organizers who made this conference possible. Special thanks to the team who organized the EAHAE this year – you did an amazing job! valued the work with the horses and the welcoming atmosphere of the conference. May 20-21, 2012. She’ll be doing a 2-day program at my location. All are welcome! I want to tell you what a great time I had at the conference ! it was so good to be with like-minds and we had a lot of fun ! 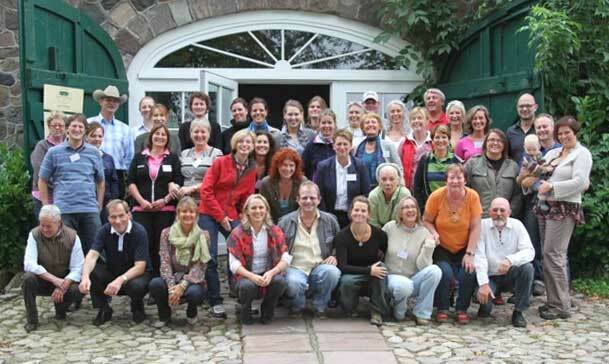 I am absorbing now and very energised, everything was lovely and I' m already to go next year - Guess which element I am ? It was so great to be with you and to feel connected ! so difficult to 'disconnect' from your wonderful company. Zuerst noch einmal vielen Dank für die Ausrichtung dieser tollen Konferenz. Kein einziger langweiliger Vortrag, im Gegenteil: sehr wichtige, informative und auch emotionale Vorträge und eine herzliche Atmosphäre. Ich übersende anliegend die Summary, die ich als Table Host für den Topic 4 aus meinen Notizen gefertigt habe zur weiteren Verwendung. Die vier Elemente meditativ auf sich wirken zu lassen und in sich zu spüren, ist sicher mit kleineren Gruppen und mehr Zeit wesentlich intensiver, war aber auch so schon sehr schön. Bei dem Test, den ich für mein Buch eher spielerisch gestaltet hatte und der freilich keine wissenschaftlichen Testansprüche erfüllt (vor allem durch seine Durchschaubarkeit - aber wer sich selbst betrügen will, ist halt auch selber schuld) hat mich wieder überrascht, wie treffsicher er trotzdem ist. Thank you so much for the wonderful conferance, it was truly great. Good organisation, fabulous food and a wonderful venue. I met such lovely people too. Die Conference war sehr interessant und motivierend und informierend für mich, schön dich und alle in so angenehm familiärer (verbunden) Atmosphäre zu treffen und zu networken. Map with conference venue, hotels, airport and train station. Work with one horse and one client. David Harris is an internationally acclaimed speaker, trainer, facilitator and coach. David is also a life learner in congruent horsemanship. He lives in Windsor, England, with his wife, two children and four horses. He is passionate about people and their amazing potential. Gerhard Krebs, born 1949, holds a university degree M.A. in contemporary German Literature and Political Science. He is working as an entrepreneur since 1983, started IT-Trainings in 1986 and founded G&K HorseDream GmbH together with his wife Karin in 1996. They both started on the seminar market with horse assisted leadership seminars and team trainings with the horse as medium and catalyst in 1998 . "A journey that leads to the place where you begin..."
"Horse Assisted Education as a part of longer development programs in organizations" (client expectations, participants insights, synergy effects). 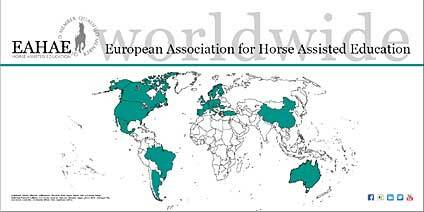 "Mental attitude of the horse in relation to his physical condition"
New HAE business: What works best? How to market our business? Experiences, what works, what doesn't? HAE pricing: experiences, references, examples? HAE exercises (continuing the "Bank of Exercises" document of the Warsaw conference): experiences, outcomes, risks, chances? The EAHAE profile. How do we represent EAHAE to the outside world? The 2012 HAE Congress: How do reorient/refocus our future EAHAE conferences creating a shared value for both members and HAE clients? "Horse Assisted Education in Science"
"The Four Energies of Leadership"
18:00 "A client perspective of HAE leadership-training. Why with horses? Benefits? Changes?" "Horses and Stories, a Combination of Ancient Healing Energies"
"Healing for the Healing Horse"